Boy, it feels good to be back. I haven’t played a Call of Duty game since I briefly dipped into the first Black Ops seven years ago. I was fatigued as hell by the series and did not care for the setting or the campaign and the multiplayer was getting increasingly ridiculous. I more or less dropped playing shooters for quite some time as well. Then DOOM 2016 came around, and Wolfenstein: The New Order, and I realized how much fun a first-person shooter can be when the campaign is engaging and you actually like the setting. If you’ve read any of my stuff before, you know I’m kind of a history buff. 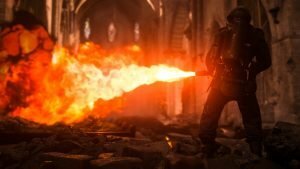 The First and Second World Wars in particular are of great interest to me, so when I heard that the Call of Duty franchise was heading back to the 40s, I knew I was probably going to play it one way or the other. 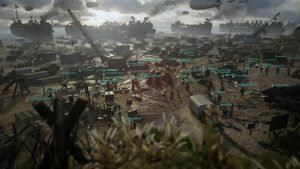 Then CGM got our hands on an Xbox One X, and from that point, it was settled that for the first time in nearly a decade, I was going to sit down and play Call of Duty: WWII. The campaign itself was a major draw for me, and it follows the fairly well-tread territory of the Allied invasion of Europe from D-Day onwards. Set pieces range from the initial landing at Normandy, blown out farmsteads in France, and stealth missions in occupied Paris to the wintery forests of Germany and the Battle of the Bulge. Unfortunately, the game only follows the American side of the conflict, and my hopes for more Eastern Front action or maybe some artillery fun in North Africa were sadly unfulfilled. However, our protagonists hit several major battles in 1944-45 and anyone who enjoyed Band of Brothers will recognize most of the settings. The story and characters are fairly well-tread stereotypes, with the lead protagonist being a good ol’ boy from Texas—named Red, I mean come on—and his best buddy, a Jewish man from New York. The latter leads the story in an interesting and surprising direction for a video game, tackling—however briefly—the horrors of the Holocaust. While the German version of the game does not feature Swastikas, at least they didn’t completely skirt the issue like another recently released game that touches—or ignores, in the German version—on similar subjects. I’ve read several complaints that the game is unduly focused on the American side of things, but let’s be real here. It’s an American game made by American developers for a primarily American audience. If that’s a huge issue for you—and I say this as a Canadian with family members that served in both World Wars—then skip the campaign. It’s your loss. It’s not a long campaign, but for a series whose primary demographic is people who only play multiplayer, I came away really pleased with my experience. The CGM review copy was played on the Xbox One X, and while I wasn’t exactly playing the game simultaneously on a PS4 classic and a non-4K television for comparison purposes, I think I can still say with confidence that the game looks fantastic on the One X and a 4K screen. Character models look crisp and clean, with little to no aliasing issues or tearing. The lighting was the most impressive, the HDR and Dynamic Contrast certainly add to the immersive experience, and character models looked nearly realistic. However, the one seemingly ubiquitous issue of lip-syncing remains, and even though the faces of the characters featured insane detail and texturing, the illusion broke as soon as they started talking. Those of you with a surround sound system or a decent headset will experience truly booming sound effects, which is a good thing because explosions, gunfire, and screaming soldiers will be constant throughout your experience. The soundtrack itself is fairly standard. It does the job well but sounds like anything else in this genre, film, or game. 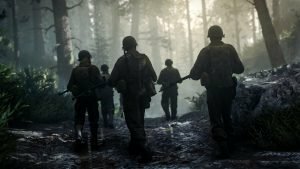 Of course, most of you will be playing Call of Duty: WWII for the multiplayer, and this game has a fairly robust if overwhelming and complicated system of upgrades, unlocks, loot boxes, and customization options. 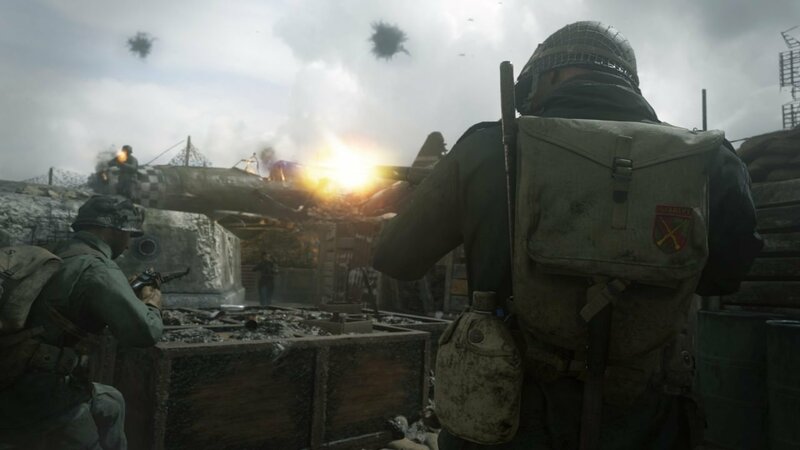 It’s been a long road from the original Modern Warfare, and the multiplayer landscape in the franchise has changed considerably since then. Players can choose from five different classes—including the Canadian mountain division, stereotypical accent in the training video and everything—known in-game as divisions. They run the standard heavy weapons guy, sniper, fast-moving submachine gun type, close quarters, and regular infantry. Each of these classes has different special weapons and unlocks, however, any gun can be used with any class but you will lose out on class-specific XP and upgrade points. The match-types include everything from Capture the Flag, Search and Destroy, and Team Deathmatch to new ones like War and Gridiron, a bizarre football-esque game type that’s surprisingly fun and a nice break from the usual modes. Hitboxes seem a bit off, and there have been some severe server issues during launch, but patches are now rolling out and things should improve. Matchmaking is another issue I came across, but that could simply be my lack of skill and time away from the franchise rearing its head. I died, a lot. 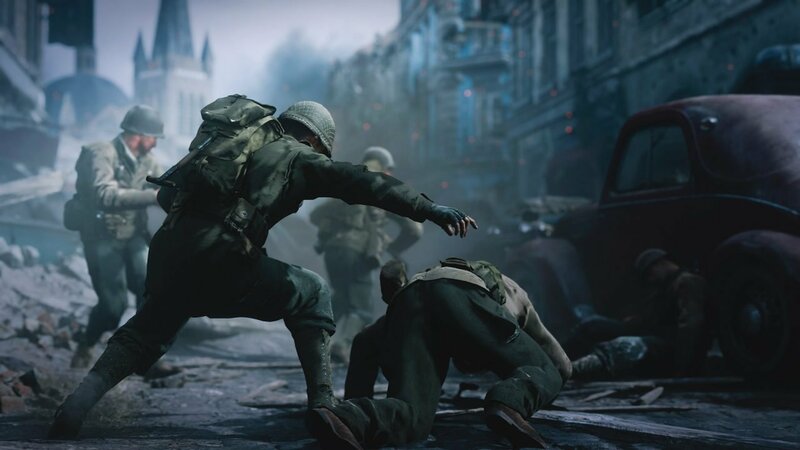 Loot boxes are, unfortunately, a staple of any modern game, but at least in Call of Duty: WWII, the fun goodies inside are cosmetic, and there is—at least as far as I could tell—no pay-to-win mechanics involved. Nazi Zombies also returns in Call of Duty: WWII, with a bit more…serious or “scary” bent to it than previous iterations. The zombies aren’t as goofy or campy, and the setting is certainly more eerie and evil than that space crap from other editions. It also features some stellar voice acting from the likes of Dr. Who himself, David Tenant, and Etobicoke local Viking Shieldmaiden Katheryn Winnick. 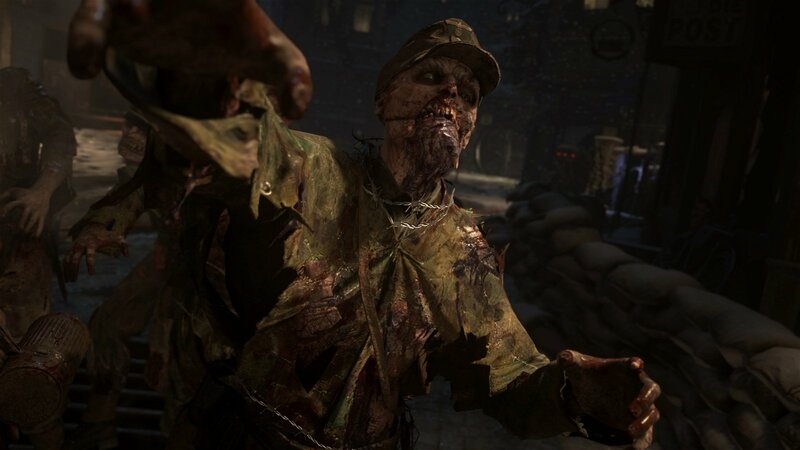 If you like Nazi Zombies, it’s the best version in years. Call of Duty: WWII is an excellent return to form for the franchise that unfortunately comes with a lot of hang-ups due to being a multiplayer shooter in 2017. However, the campaign is a blast, the shooting and combat mechanics feel tight, and it looks gorgeous on a 4K screen. It feels really good to be back in the setting that spawned the franchise, but even if WW2 isn’t your thing it’s still an enjoyable campaign with a deep—if a bit overly complex—multiplayer component to keep players engaged as well as a refreshingly spooky Nazi Zombies mode. 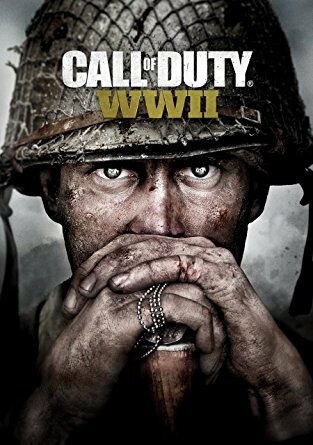 If you like Call of Duty but have felt fatigued by the last few releases, this should scratch your itch while also feeling nostalgic enough to get older players into the action. Call of Duty returns to the European Theatre in stunning 4K.